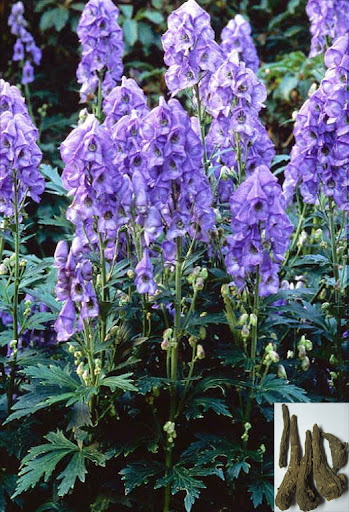 Common Name: Prepared aconite root, Dried parent root tuber. 1. Collapsing of yang syndrome manifested as cold extremities, spontaneous cold sweating and fading pulse. Prepared aconite root (Fuzi) is used with Dried ginger (Ganjiang) and Licorice root (Gancao) in the formula Sini Tang. 2. Collapsing of yang qi syndrome manifested as profuse sweating, shortness of breath and asthma. Prepared aconite root (Fuzi) is used with Ginseng (Renshen) in the formula Shen Fu Tang. 3. Deficiency of kidney yang and declined kidney fire manifested as chills, cold limbs, soreness and weakness of lumbar region, impotence and frequent urination. Prepared aconite root (Fuzi) is used with Cinnamon bark (Rougui), Dogwood fruit (Shanzhuyu) and Prepared rehmannia root (Shudihuang) in the formula Gui Fu Bawei Wan. 4. Weakness of spleen yang manifested as cold in the epigastric and abdominal regions and diarrhea. Prepared aconite root (Fuzi) is used with Ginseng (Renshen), White atractylodes (Baizhu) and Dried ginger (Ganjiang) in the formula Fuzi Lizhong Wan. 5. Heart yang deficiency manifested as palpitations, shortness of breath and stifling sensation and pain in the chest. Prepared aconite root (Fuzi) is used with Ginseng (Renshen) and Cinnamon twigs (Guizhi). 6. Deficient yang in the spleen and kidneys manifested as dysuria and general edema. Prepared aconite root (Fuzi) is used with White atractylodes (Baizhu) and Poria (Fuling) in the formula Zhenwu Tang. 7. Weakness of defensive yang manifested as spontaneous sweating. Prepared aconite root (Fuzi) is used with Astragalus root (Huangqi) and Cinnamon twigs (Guizhi). 8. Invasion by wind and cold in a person with deficient yang. Prepared aconite root (Fuzi) is used with Ephedra (Mahuang) and Asarum herb (Xixin) in the formula Mahuang Fuzi Xixin Tang. 9. Cold-damp obstruction syndrome manifested as general joint pain and chills. Prepared aconite root (Fuzi) is used with Cinnamon twigs (Guizhi) and White atractylodes (Baizhu) in the formula Gancao Fuzi Tang. Dosage: 3-15 g, decocted in water for an oral dose; 1–2 g, if used in powder. 1. Due to toxicity, Radix Aconiti must be decocted in water 30–60 minutes before the other herbs. 2. It is contraindicated for use during pregnancy. 3. It is incompatible with Rhizoma Pinelliae (Ban Xia), Fructus Trichosanthis (Gua Lou), Bulbus Fritillariae Cirrhosae (Chuan Bei Mu), and Rhizoma Bletillae Striatae (Bai Ji).